Ama Dablam is the third most popular Himalayan peak for permitted expeditions. The most popular route by far is the Southwest Ridge. Ama Dablam was first climbed on March 13, 1961 by Mike Gill (NZ), Barry Bishop (USA), Mike Ward (UK) and Wally Romanes (NZ) via the Southwest Ridge. They were well-acclimated to altitude, having wintered over at 5800 meters near the base of the peak as part of the Silver Hut Scientific Expedition of 1960-61, led by Sir Edmund Hillary. The best climbing months are April- May and September, October, November. Trek starts in the morning after breakfast. The walk today is pleasant with few short uphill and downhill with multiple crossings over Dudh Koshi River and magnificent view of Mt. Thamserku (6,608 m/21,675 ft) from the Benkar village. Cross some more bridges and reach the entrance of Sagarmatha National Park at Monjo, where our trekking permits are checked in order to keep record of trekkers and local trekking staffs as well. A descend and a gradual walk brings us to Jorsale, the last village until Namche Bazaar. The walk is enjoyable through the river bed and we reach Hillary Suspension Bridge. Now, as we climb up hill towards Namche Bazzar, closer and magnificent sight of Kwangde Peak, its sister peaks, Kusum Kangaru, Mt. Everest, Lhotse, Tawache, and many other fabulous mountains are viewed closer, we stop at the Chautara here to admire the view. Finally, we reach the colorful village of Namche Bazzar, the main gateway of Khumbu region. This is first scheduled ‘acclimatization’ day for this trek. Health experts always recommend us to stay active and moving during the rest day too instead of being idle. We either spend the day taking a day hike to Thamel or visiting Khunde or carry out relaxed exploration of Namche Bazaar itself. Namche Bazzar is the main centre of the Everest (Khumbu) region and has government offices, ATMs, Internet cafes, shops, restaurants, a bakery and a colorful market each Friday evening and Saturday. If we trek a few hundred vertical feet during the day, it will help us to properly acclimatize. Visit the Tourist Visitor Center near the Sagarmatha National Park headquarters and observe an assortment of things related to the first Everest ascenders, Sherpa culture and learn about the various plant and animal life of the Everest region. We also take an interesting side trip up to Khumjung and climb up to famous airstrip at Syangboche. Just above the airstrip is the Everest View Hotel, a Japanese scheme to build a deluxe hotel with great views of the highest mountains on Earth. The Khumjung valley surrounded by the snowy peaks of Kongde and Thamserku and the sacred peak of Khumbila hosts a well known monastery that houses a yeti scalp. Visit Hillary School which is at the same site. After having lunch and spending some time in Khumjung, walk back down to Namche Bazzar. From Namche, the well-worn Everest trail contours around the side of the valley high above the Dudh Kosi. As we follow the path, we will get even better views of the great peaks of the Khumbu: Everest, Lhotse, Nuptse and Ama Dablam. Passing by several villages and numerous tea shops, we will cross the Dudh Kosi river and make a steep climb to Thyangboche, home of the famous and recently rebuilt monastery. 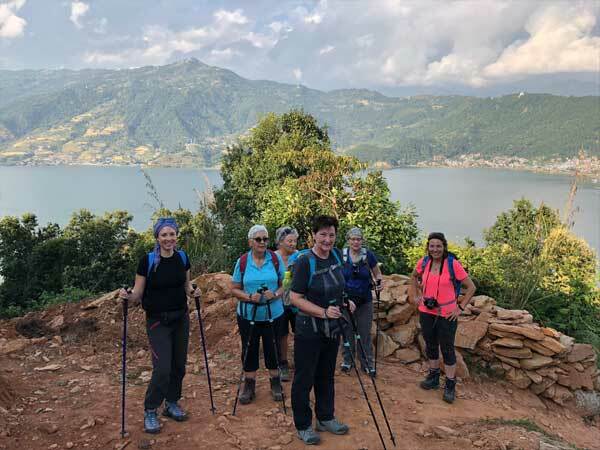 We have plenty of time to look around Thyangboche, the monastery and have a cake at the bakery before dropping down to the river and the village of Deboche (3,700 m/12,135 ft) a little further along the trail, where we will stay in a relaxing lodge. It’s 1.5 hours walk further up the trail to the village of Pangboche (4,000 m/13,120 ft). Pangboche is situated directly below Ama Dablam and many of the Sherpas who work on the mountain each season are from this village. We continue up the trail from Pangboche to Pheriche, where we stay in one of the comfortable lodges there. We trek back down the trail to the bridge at Pangboche and cross the Dudh Kosi before climbing up the far side of the river and following the trail and ridgeline up to base camp (3.5 hours from Pangboche). Base camp is an idyllic, grassy spot from which the majority of the climbing route up the mountain is visible. The views across valley from the base camp area are excellent, with Cholatse (6,440 m) being particularly dominant and Cho Oyu (the world’s 6th highest mountain) visible in the distance. We will have lunch here, before descending back down gentle, grassy slopes to Pangboche for the night. Descend to Base Camp. Any energy left from the climb and descent will be used to celebrate our summit push and safe return! We leave base camp in the morning and hike down the hill to Pangboche. After tea we continue down the valley and through thick rhododendron forests to Thyangboche. Thyangboche is home to the most influential and active monastery in the Khumbu and we will have time for a quick visit and lunch. We then continue walking, with a big drop down to the Dudh Khosi River and a dramatic suspension bridge. After crossing the bridge we climb again to Sanasa, and then contour along hillsides and over small ridges until finally dropping into Namche Bazaar. Our final day of walking covers the same ground we spent 2 days climbing on the way in. Now that we are acclimatized we cover the distance easily, and enjoy the many suspension bridges, tumultuous rivers, small towns and monasteries. After lunch in Phakding, the trail climbs a final 600 vertical feet (180 meters) to the airstrip in Lukla, and our final lodge where we spend the night. We fly back to Kathmandu after our long mountain journey. The early morning flight drops us at Kathmandu. You can rest and relax throughout the day in your hotel. If get interested to take some gifts home from Nepal for friends and relatives, visit some nearby shops or venture out in Thamel for typical Nepalese goods which can be assisted by our guides or you can do it yourself too.